I expected too much, too soon. I thought that if I put that multi-colored chore chart up for the 10 chores that I wanted my kids to do around the house, then my kids would check it off and do it. How many fights my son would start with his sister. The ways my kids would feign incompetence and tell me how much help they needed. It was overwhelming for me, so I quit the chore charts thinking that it would just be easier to do all this myself. 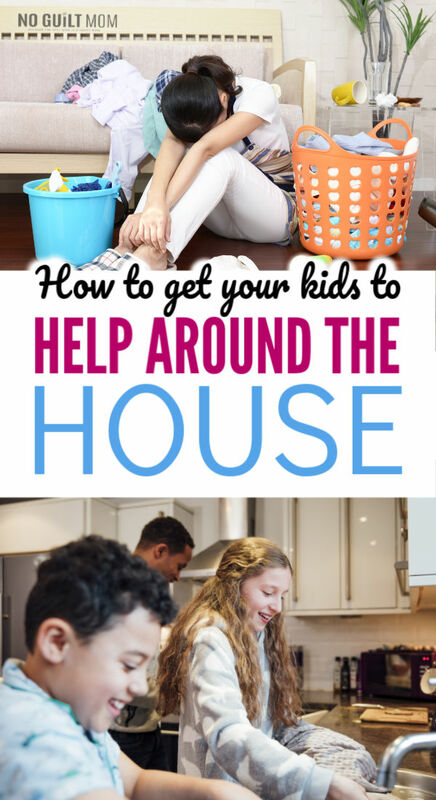 Here’s how we turned the chore game around in our house and how you can do the same in yours. For us, it was loading and unloading the dishwasher. Oh… that dishwasher. Such drama. 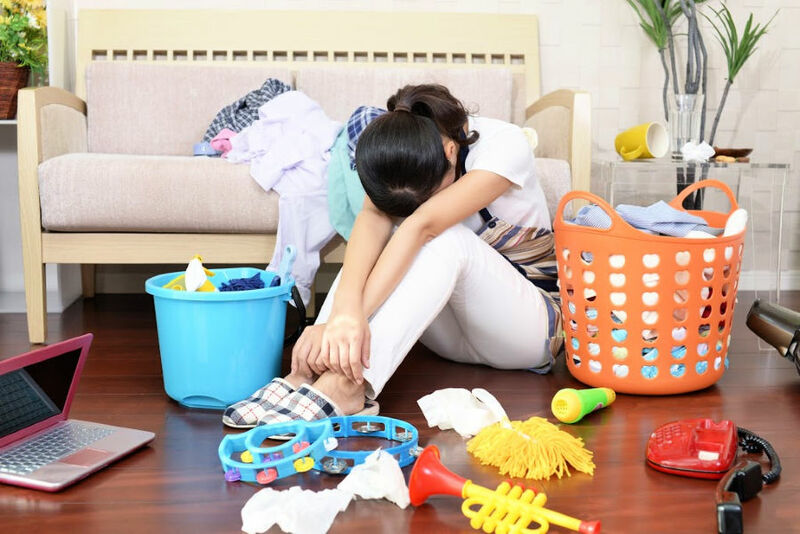 Once you choose the one chore, tell your kids WHY you need the help. I want them to know how to load and unload the dishwasher. When they’re on their own, its a task they’ll need to do themselves. We belong to a family and we help each other out. The huge benefit of starting with a single chore is that It’s much easier to hold your kids accountable for it. At the end of the day, my brainpower is maxed out. One chore is all I can remember. So, I take that one chore, write it on our chore board and point when I no longer want to form coherent sentences. Oh, yes… here is our chore boards. They are not “aesthetically pleasing” or multi-colored. 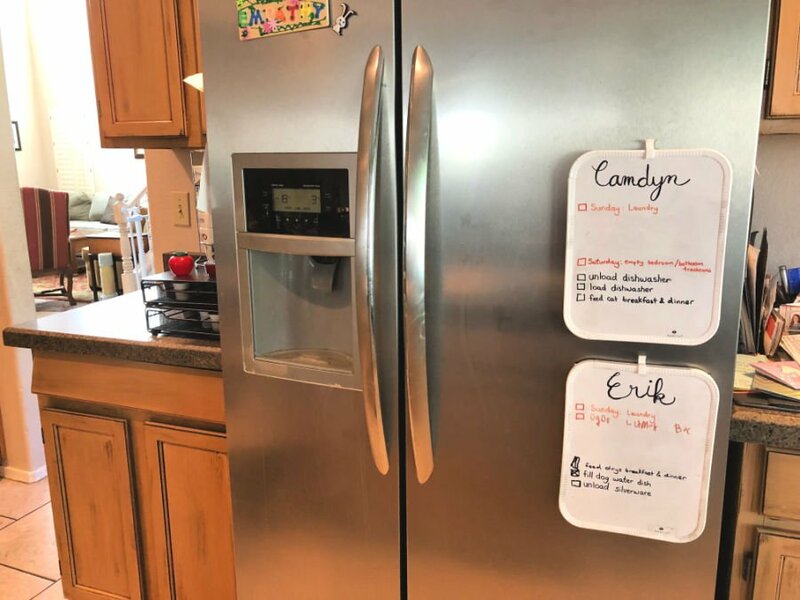 They’re simply magnetic whiteboards – one for each child- that hang on our fridge. Everything permanent on the boards I’ve written in sharpie. It does require a touch-up occasionally because sharpie erases when dry-erase marker writes over it and then you erase. We started with one chore and added to the list when they mastered that one task. This chore chart has been up for 4 months and you may notice it doesn’t have too many chores on it. I ask my kids to do little things all the time. But these are the chores that I make my kids personally responsible for. I back off of these chores. Do the chore for them. I wish that I could tell my kids to do something and they would magically do it perfectly. But no, kids need to be taught each task step-by-step. Because you have high expectations and you want them to reach those. Super droll stuff. You’re imparting your wisdom as best you can and showing how you expect the job to be done. Will they listen to it all and do it perfectly from then on? Nope. But, that’s why this is a process. And then they’ll do it completely sloppy and wrong. Stick with going through the whole task and explaining it. Encourage them to ask you questions. Because this is the last time you will EVER do this job alone while they’re still at home. Now that you’ve explained it, It’s time for them to take over. Watch them as they unload the dishwasher. Tell them everything they’re doing right during the unloading. Offer mostly praise throughout the task. When they finish, stick to only one suggestion on how to improve next time. Keep it positive and you’ll have an easier time getting your kids to pick up the job. But, oh… this is not the easy part. This is the most difficult step. Because we as parents don’t like letting go. We’ll still want to offer suggestions, tell our kids how to do it and be involved every step of the way. They are not going to be perfect at this job. Dishes are going to drop on the floor and break. 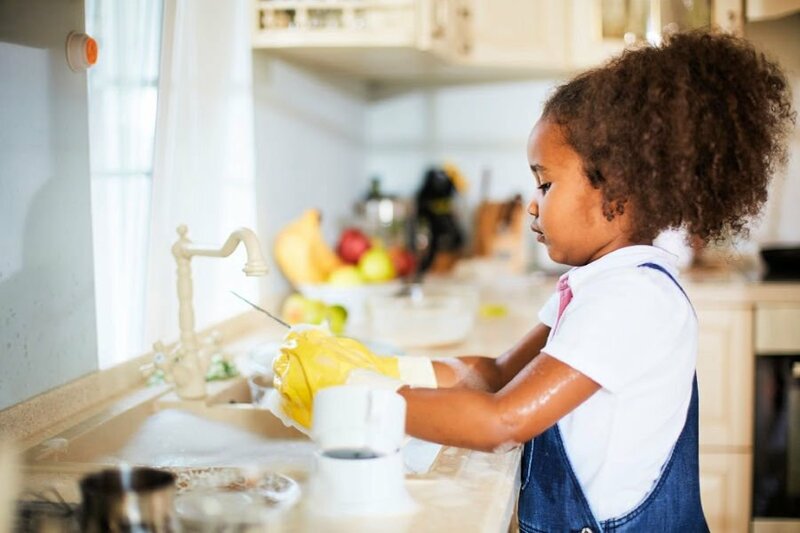 When I taught my kids the dishes, it took 3-4 months to get the job drama-free. According to child psychologists William Stixrund, PhD, and Ned Johnson, authors of The Self Driven Child, many parents mistakingly think that once they release responsibility it will be smooth sailing. There will be an adjustment period where it feels like this will never work and you’ll be fighting about chores for the rest of your life. But, here’s the thing. As soon as you assign it to them as their responsibility, you refuse to fight. Let me say that again, refuse to fight your kids. You’ll need to enforce the chore. The trick is making the chore a priority over anything else they want to do while keeping it positive. Approach it from the philosophy that you’re on your kids’ side. 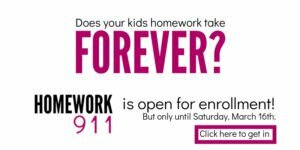 You want them to have fun and enjoy themselves…once they do their chores. Simply agree to everything (within reason), but add that little stipulation. Those dishes on the counter? That’s now your kids’ responsibility. Laundry piling up? It’s your childrens’ job to make sure it gets in the washer. How much stress does that alleviate from you right now? It’s going to happen. Once you choose one chore, post it visibly, teach your kids how to do it and keep them accountable, you’ll finally get your family to help around the house.